During the past several years, the Chattanooga Public Library has transformed its layout to include multiple makerspaces, complete with all the tools necessary to embark on projects such as music recording, 3D printing, sewing, and design. In the years immediately following the onboarding of the Gig, Chattanooga’s newfound status as a hub for innovation and technology projected an exciting but skewed view of the city and its residents. Despite accelerated growth in entrepreneurial and technology resources, the city’s poorest residents were, in many ways, left behind—still struggling with no or slow Internet and an education system that didn’t connect students to the skills of tomorrow. Today, however, the city is working to close the rift. Stepping off the elevator onto the second floor of the Edney, nearly everything in view is brightly colored—from the purple, orange, and red plastic figurines on top of the reception desk to the multicolor chairs surrounding a large conference table in an adjacent spacious room. 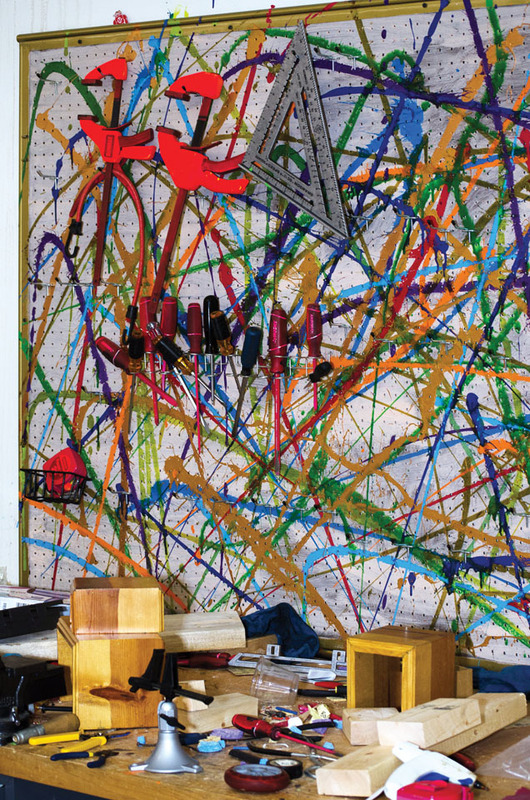 Across from the table, which is topped with nearly a dozen laptops, large neon-colored beanbags and a modular bench shaped like a rollercoaster serve as flex space for creative minds to brainstorm. Beyond the conference table room is a narrow space with large glass windows, through which six 3D printers with quirky names like Petunia and Cornelius are visible. If stimulation is the goal, then Techtown, located in the heart of the city’s Innovation District has achieved it. Though it may resemble your average creative technology workspace, Techtown is not a hip startup catering to millennial employees averse to a traditional office atmosphere. It is a learning center connecting predominantly school-aged children to classes and camps that equip them with technology-related skills. 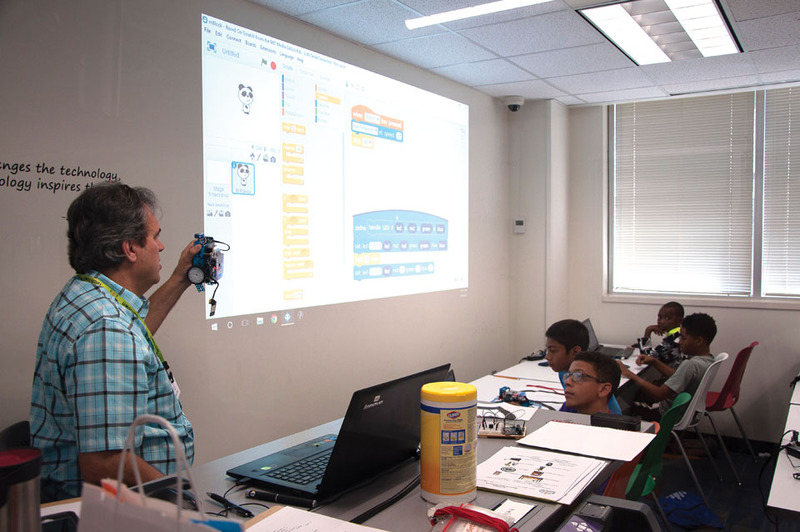 Started in 2014 as a foundation, Techtown offers classes and summer camps in various disciplines with the goal of “leveling the playing field for all young people by providing access to an unique technology and entrepreneurial learning center.” Programming includes robotics, 3D design, film, game design, and other disciplines and targets two age groups, appropriately named Megabytes (11 to 17 years old) and Kilobytes (7 to 10 years old). In fact, Ramsey says, at its heart, Techtown is not just a hands-on learning center; it is the earliest stages of workforce development. 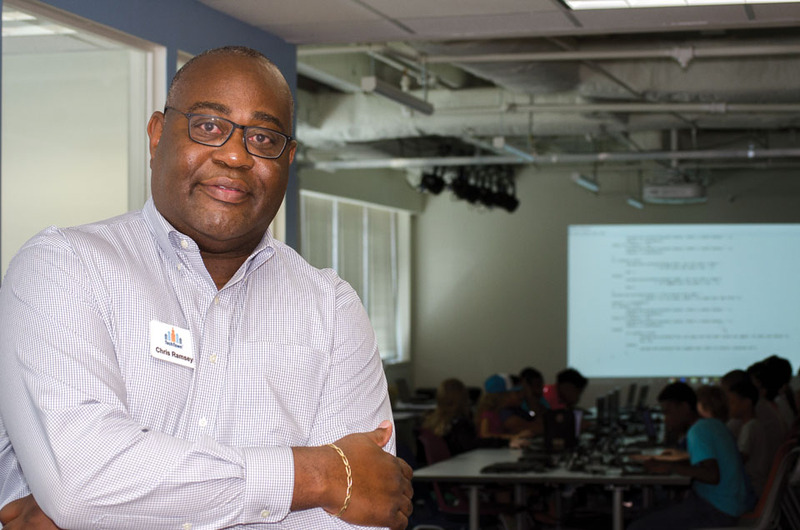 In addition to hosting courses in its downtown center, Techtown works with students in 54 schools across the city to integrate project-based technology learning into the classroom curricula. Many of the participating schools are in lower-income neighborhoods and represent a population that might not experience a locally much-discussed benefit: digital equity. 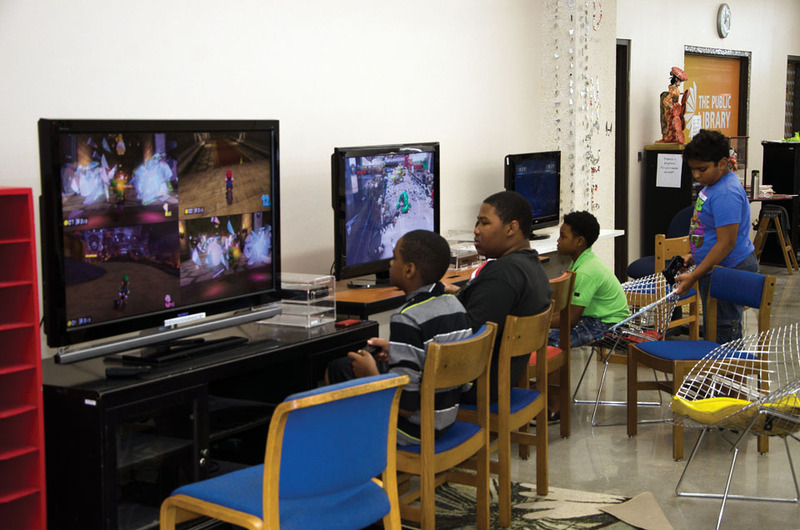 Young gamers take advantage of the library’s multiple game consoles and large screens. The Chattanooga Forward Technology, Gig, & Entrepreneurship Task Force identified digital inclusion as one of its strategic goal areas in 2014. In its closing report, the task force characterized the access to and ability to navigate computers and the Internet as an essential component to success in school and the workplace. Through the Innovation District’s Enterprise Center, the city is working to shrink the digital divide with Tech Goes Home Chattanooga. Organized into four tracks, Tech Goes Home Chattanooga offers students, parents, and community members 15 hours of instruction on topics ranging from conducting an online job search to accessing web-based family resources. At the end of the course, participants have the option to purchase a new Chromebook for $50 and can receive assistance in securing low-cost Internet. 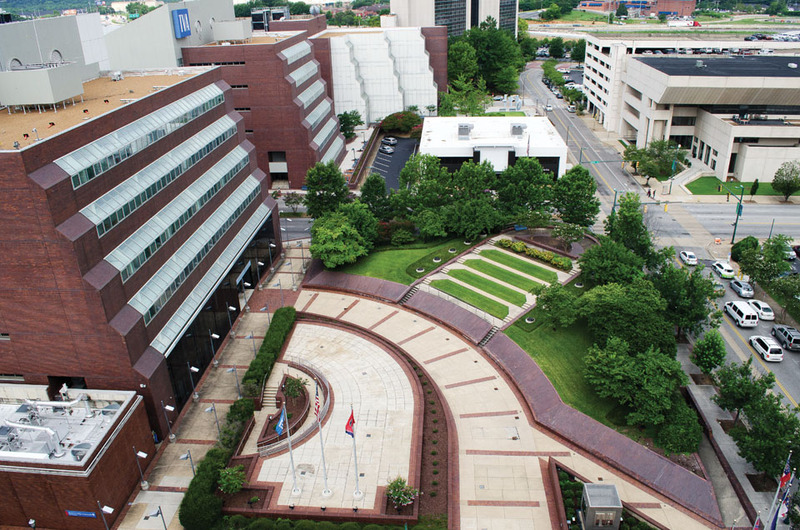 He points to other community-based learning environments, such as the Downtown Chattanooga Library, as prime examples of how the city is coming together to facilitate hands-on education regardless of one’s socioeconomic background. 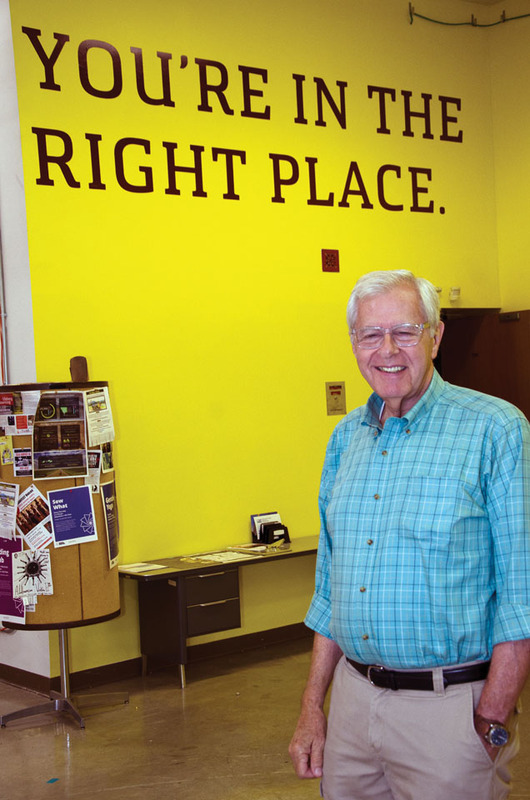 Ron Littlefield chats with a library goer inside the facility’s newly opened The Studio, a space where young people can learn about sound engineering and recording. In 2012, the Chattanooga Public Library system was like most others across the country—a network of centrally located buildings where residents could access books and other media. But later that year, it began a transformation that has made it a model for a new kind of library, one that not only houses media but also allows the community to create it. Speaking to the Tennessee Libraries journal in 2012, Chattanooga Public Library Executive Director Corinne Hill articulated her vision, one that has largely come to fruition during the past five years. On the 4th floor of the Downtown Chattanooga Public Library, what was before a 12,000-square-foot makeshift warehouse of city records has become what residents simply call 4th Floor, a raw makerspace where members of the community can participate in various creative classes and workshops, as well as create everything from screen-printed T-shirts to 3D printed designs. Other amenities include photography prop equipment, sewing machines, power tools, a weaving loom, a virtual reality system for gaming and development, and a laser cutter, to name a few. Students in a Techtown robotics summer camp learn about programming the Makebot mbot. 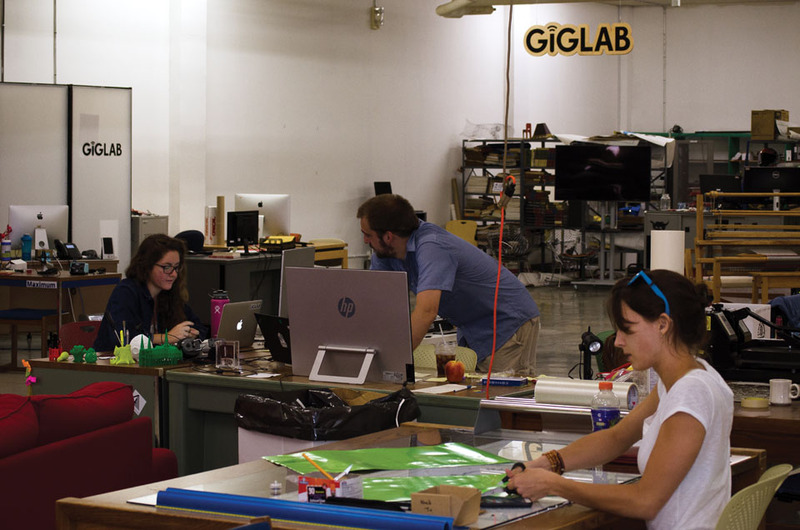 Perhaps the coolest part of the 4th Floor is the Gig Lab. Launched in November 2014, the lab’s desktop computers are hardwired into the Gig, allowing users to access fastest-speed Internet for free. It was here that musicians from Chattanooga were able to play alongside musicians in Burlington, Vermont in real time during International Make Music Day in 2016. Utilizing the ultra high speed of the Gig, the 4th Floor created a live stage where low latency audio/visual technology and Internet2 enabled participants in Chattanooga to not only watch seamless performances taking place in perfect unison across 1,000 miles but also engage in instrument lessons. Keeping in line with the musical theme, the Downtown Library’s latest addition is The Studio. Located on the building’s 2nd floor—a haven for kids through tweens who can access resources such as 3D printing, an arcade, and button-making equipment—The Studio brings first-in-class recording equipment and software to the public realm. And teens can not only use The Studio’s three live rooms, but also participate in a host of related classes, from beat making to audio engineering for vocals and acoustic guitar. The Chattanooga Public Library has been instrumental in closing the opportunity divide by creating tactile learning and making environments where members of the community can explore and create content. Several organizations in the city pick up that work and carry it into another key area: entrepreneurship. Started in 2011, LAUNCH Chattanooga’s mission is “Empowering underserved communities and individuals through entrepreneurship.” While the city can point to numerous organizations providing coaching and resources to entrepreneurs, LAUNCH was the first to focus on people that might otherwise be left out of the city’s burgeoning business movement. LAUNCH Executive Director and Co-Founder Hal Bowling first began thinking about entrepreneurial inclusivity while teaching entrepreneurial classes as CO.LAB. Partnering with CO.LAB to flesh out the idea, Bowling originally conceived LAUNCH as an initiative, and it quickly grew into a full-fledged organization facilitating classes in the East Chattanooga, Brainerd, Hill City, and Alton Park communities of Chattanooga. Participants in LAUNCH engage in the Business Entrepreneurship Academy, a 10-week program for people in the community who want to start a business or are already business owners. Covering topics such as creating a business plan and utilizing social media and promotional tools, the purpose of the academy is to equip underserved individuals with the tools and skills necessary to create wealth and jobs in their communities. ►▼ The 4th Floor of the downtown Chattanooga Public Library provides access to myriad tools and materials to fuel the community’s creative spirit. At the end of the program, LAUNCH continues to provide resources through networking and funding partners, as well as a regular roundtable meeting, where graduates can connect and share their experiences and successes. To date, LAUNCH has trained more than 300 entrepreneurs and had a direct impact on the creation or development of 182 businesses, resulting in nearly 230 new jobs in Chattanooga. Early into the organization’s genesis, Bowling and the LAUNCH leadership noticed a trend in some the neighborhoods it was serving. Students who were graduating from high school or dropping out before graduation were returning to their communities as adults with little or no entrepreneurial skills to market themselves. Using Alton Park’s Howard High School as a pilot program, LAUNCH began partnering with schools to provide classes. Bowling says that, unlike the adult classes, the students have to start from scratch, which is a rewarding process for not only them, but also the LAUNCH staff. Regardless of age, economics, or skill, training a diverse community of entrepreneurs is less about having a certain density of business startups and more about promoting possibilities within the lives of Chattanoogans. By partnering together in the classic Chattanooga Way, countless civic, public, and private entities are ensuring no community is left behind in the city’s growing knowledge economy.